BACKGROUND: The be.group’s Andres Duarte II is an affordable senior housing project located in Duarte, California. Complementing an existing 80 unit building, the newly constructed LEED Gold and CASp (American Disabilities Act) certified building provides 43 units within walking distance of public transportation, shopping, a post office, City Hall, and the Duarte Senior Center. The contemporary craftsman style building consists of a four-story wood frame construction and one-level subterranean parking. This United States Green Building Council’s (USGBC) Leadership in Energy & Environmental Design (LEED®) Gold Certiﬁed building takes advantage of deep overhangs, high-eﬃciency glazing, quality insulation, and LED lighting. Residents enjoy a variety of amenities including a community room, a computer/library room, a crafts area, a fenced dog run, and an outdoor patio and BBQ area facing the foothills of the Angeles National Forest. Andres Duarte II contributed to revitalizing the urban core with a high quality project that provides comfortable homes for those who would be stressed to find adequate market rate homes. 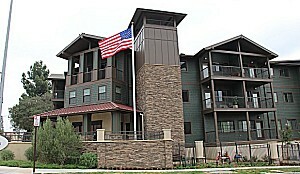 VCA Green was engaged to manage the LEED and CASp project to obtain certification. 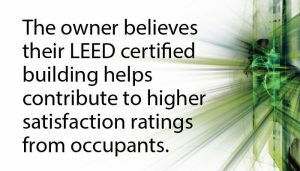 Why the Owner Chose LEED? The be.group is committed to engaging in energy efficient upgrades across its portfolio of buildings. Since Andres Duarte II is the first new from-the-ground-up project for the be.group, they opted for LEED Gold to help deliver return on investment and to demonstrate their commitment to sustainable practices. LEED is seen as a premier industry benchmark that will help measure sustainable performance. The be.group believes that their LEED certified building helps contribute to higher satisfaction ratings from occupants. According to a study published by the USGBC, the end user can save about 30% in energy costs annually when living in a green building. The project is located near bus lines within the Foothill Transit District, and it provides tenants the choice to take alternative means of transportation. Within a quarter mile walking distance are restaurants, stores, a post office, and other services that reduce vehicle trips. Also within a quarter mile is a safe walking path to the Duarte Sports Park, Duarte Senior Center, and City Hall which provides community interaction for residents. Turf or grass, which generally requires large amounts of water, was not installed on the project. Drought-tolerant plants with drip line irrigation is installed, which conserves potable water use for landscape. A weather-based irrigation controller prevents watering in the event of rain. High-efficiency fixtures, including low-flow showers, faucets, and toilets, were installed in every unit. The resulting savings in indoor water use is more than 20% compared to other like-kind projects. Beyond conserving a vital resource, less water usage reduces long-term operating costs for tenants and ownership. The heat island effect is caused by the sun’s heat striking surfaces such as parking lots, and steel/glass structures which absorb and then emit that heat. Vehicle parking for Andres Duarte II is located underground with the exception of a clean air vehicle and visitor parking spaces. Underground parking helps to maximize construction footprint efficiency and helps to minimize the urban heat island effect. 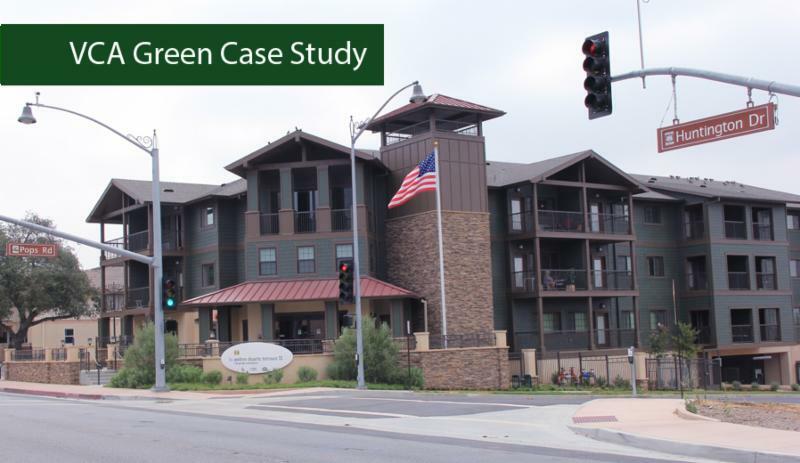 The project reduced the amount of building material used, maximized space efficiency, and achieved the equivalent of 10 LEED points by keeping apartment units small. This helped earn more points for density, with a density factor of 75 dwelling units per acre. 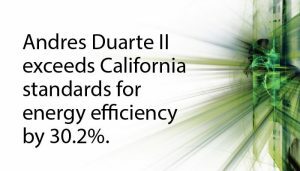 Andres Duarte II exceeds California standards for energy efficiency by 30.2%. This was achieved by installing high-efficiency HVAC units and water heaters. LED lighting is used throughout the building and in all units. Superior insulation allows for more comfortable units that require less heating and cooling. All in all, these measures save tenants approximately 30% on energy costs annually. Even on 90 degree day during construction, before air conditioning units were powered, the well-insulated units felt much cooler than expected, demonstrating the effectiveness of quality insulation installation. 80% of waste generated by construction was reused, recycled, or otherwise diverted from landfills. Environmentally preferable wood products were used throughout the project. The foundation’s aggregate and insulation used in the building both contain recycled content helping reduce the need for virgin resources. Additionally, vinyl flooring is made of recycled material and is FloorScore certified. Indoor Air Quality is an important factor in green building and to the health and well-being of the tenants. Andres Duarte II is a smoke-free building, reducing exposure of occupants to second-hand smoke. All units have quiet operating fans that deliver fresh air directly to units helping to ensure stagnant or moist air is not trapped for extended periods of time. Bath fans have automatic humidistats which turn on automatically when moisture levels increase within bathrooms. Paints, primers, sealants and glues, as well as carpeting and flooring, used on the project contain low quantities of harmful volatile organic compounds (VOCs), which are harmful when inhaled. Another feature in each unit is that all cabinet materials meet or exceed the requirement for low formaldehyde content, which can irritate or harm the occupants. Combined these measures help ensure a better indoor air environment and help minimize as the risk of sick building syndrome.